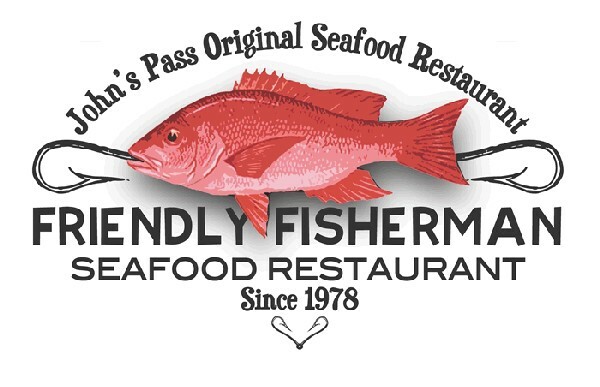 Inshore– We are seeing lots of pompano, sheepshead, and a few mackerel around the pass. Plus, there’s the occasional trout and snook too! The pompano have been biting on the docs goofy jigs with a pink teaser or the ½ ounce Nekid ball jigs bounced just 6-8 inches above the sandy bottom along the beaches or at the tips of the jetties. The best tides for the pompano have been the start of either incoming or outgoing. 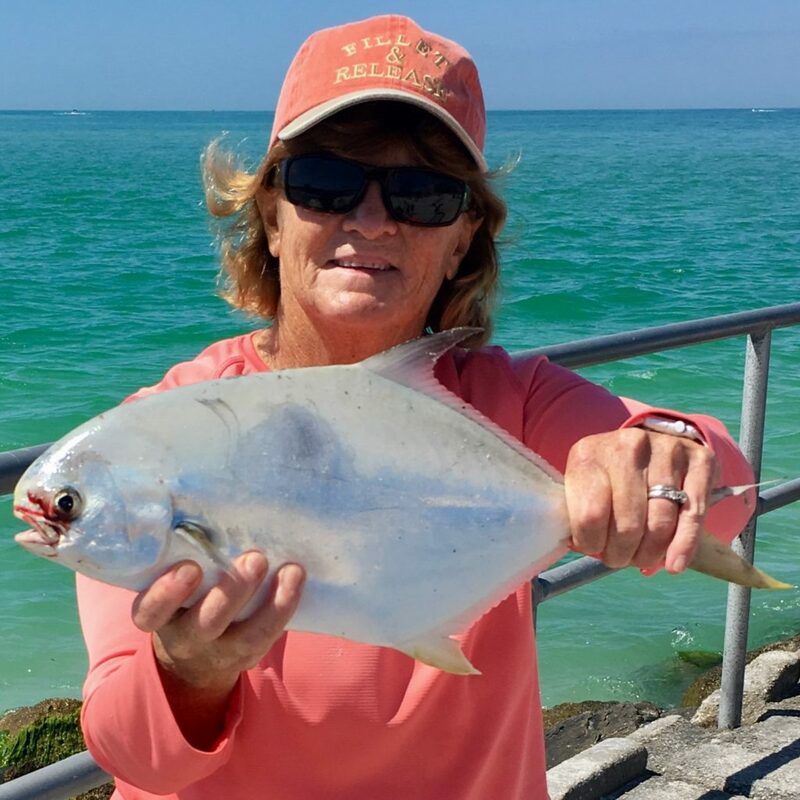 Eileen Kivlin, from Upstate New York, has been crushing pompano daily using the methods above and even got one nearly 20 inches this past week from the western tip of the north jetty of Johns Pass! John Koslosky, from Chicago, was fishing with his son catching nice speckled trout just past the drop off of along the middle of the north jetty of Johns pass using light weight around the start of the incoming tide. 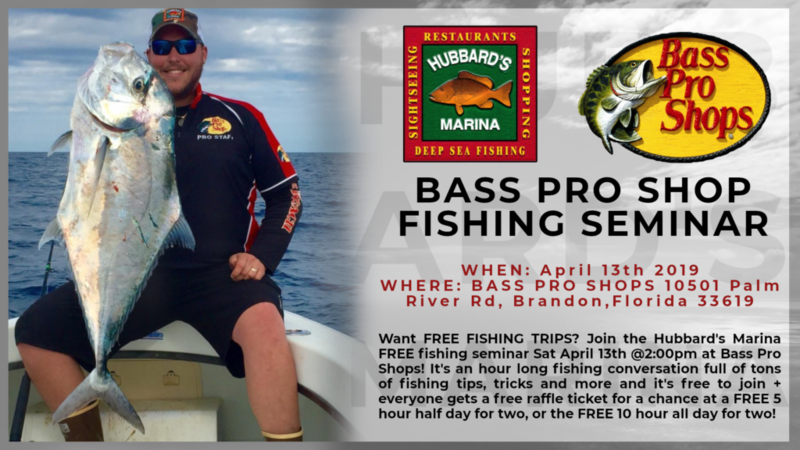 Doug Bryan, a St Pete local, has been fishing quite a bit around the pass catching lots of sheepshead from under the south side of the Johns Pass Bridge around the rocks. Plus, Doug confirmed that the pompano bite has been off the chain this past week around the beaches. Finally, Doug caught around a 31 inch snook using ultra-light tackle in the upper Boca Ceiga bay around the bay pines VA hospital. The white bait is still thick around the pass right now especially around the middle of the bridge in the deeper faster moving waters. Near shore– The kingfish are definitely still the highlight near shore right now with tons of them coming up on the troll and the flat line too! We are seeing a few hogfish around the 40-60ft of water areas on live shrimp or fiddler crabs along with the plentiful kingfish. The snapper bite has been decent near shore too, especially around the deeper near shore waters the mangroves have been biting well but due to the clearer waters they have been a little more leader shy as of late. We are still seeing some lane snapper action and also the sheepshead are still spawning near shore on the artificial wrecks so fiddler crabs on a super light knocker rig on shallow 20-40ft structure can catch you some monster sheepies. The mackerel have been super thick too around the bait schools around 1-10 miles from the beaches, trolling the smaller 2-4inch spoons behind a #1 or #2 planner has been the best option for catching tons of mackerel or the smaller magnum 20 rapala xrap lures. Offshore – The 12 hour extreme trips have been our only deep water offshore public trips as of late, but we have had some offshore private fishing charters too! 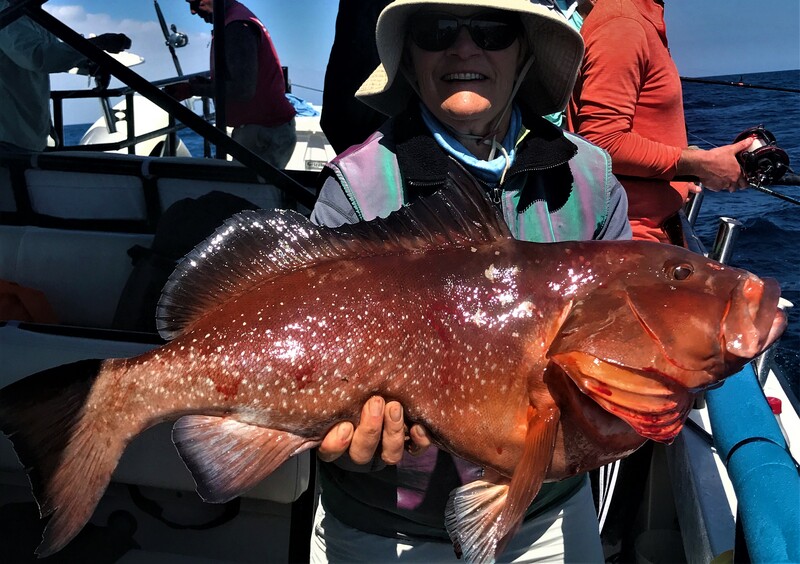 The bite for red grouper has really improved inside the 20fathom closed area which has been a great sign for the deeper water offshore trips. Plus, we have seen a huge uptick in the mangrove snapper action from 100-120 foot of water. They are biting best with around 40-50lb test since the water is so clear they are a bit more leader shy. Keep in mind after april first that 20 fathom closure on grouper harvest ends and we will once again be able to keep grouper past 120 foot of water. We are really looking forward to that this coming week so we can get deep again and hammer lots of big triggerfish, scamp grouper and monster red grouper too. Right now were a little handicapped since we can get out to 140-180 foot where we see those monster triggers and scamp too. 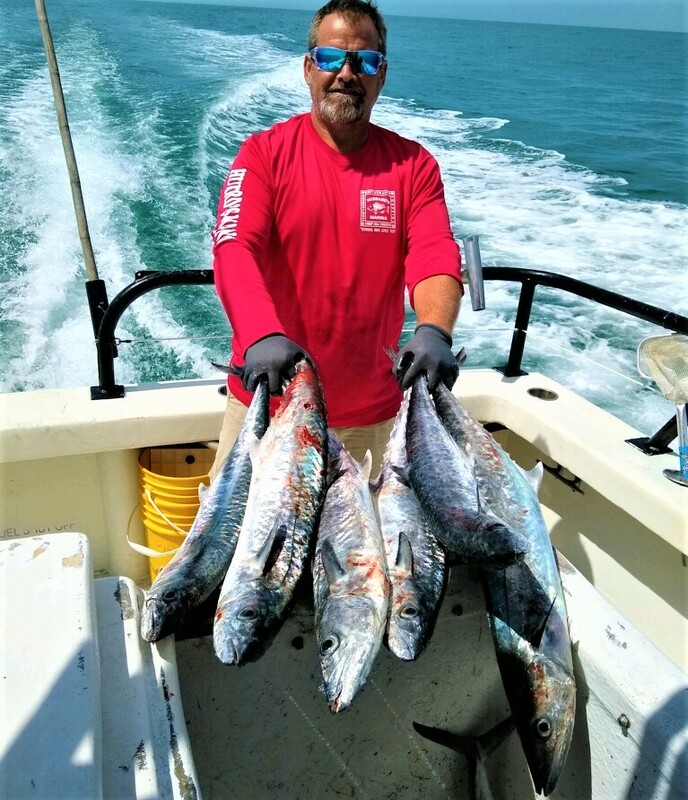 The kingfish action continues offshore too, from the beach to as far as we fish the kingfish are thick nearly everywhere and offshore past 100 foot is where we are catching the true monster kings in the 30-50lb range! Plus, out there past 100 foot we are seeing the blackfin tuna too which is a great bonus to the killer bottom fishing we have had as of late. 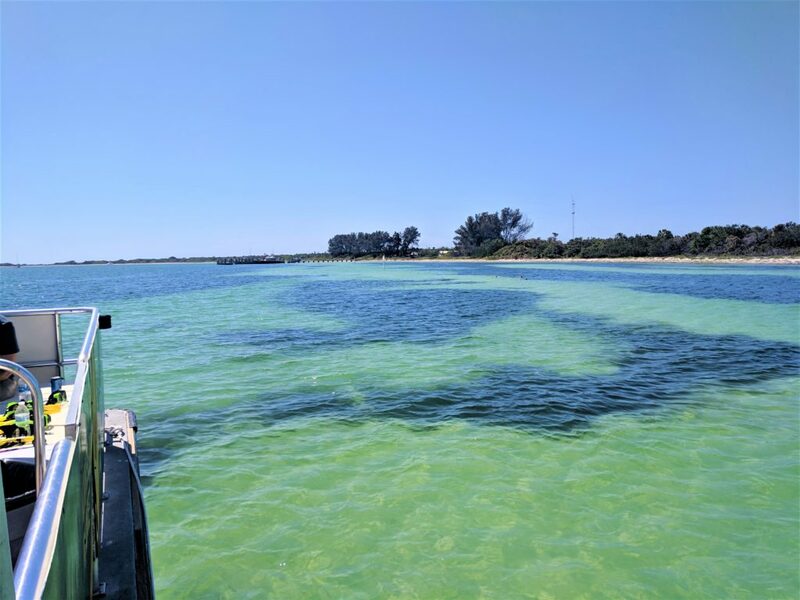 SUPER Clear water right now in and around Johns Pass and upper Boca Ceiga bay, making it a great time to go cruising on our dolphin cruise or sunset tour! Especially between the cold fronts, right behind a wind event the water gets a little stirred up but a few days later the water clears back up beautifully. Our local resident dolphins are back in the area and with the beautiful spring conditions we are seeing huge pods of dolphins grouped up together feeding and playing and teaching their young juvenile dolphins more about hunting and using their sonar by playing ‘catch’ with the plentiful jacks and sheepshead. Last year’s newborn dolphins are now juveniles and we are seeing them play together often in the back bays and getting very active at the surface while even showing off some of their acrobatic displays. It’s the beginning of bird nesting season at dog leg key our local sea bird rookery. We cruise by this island on every dolphin watching nature cruise and eco tour and also during some of our sunset cruises too. We are seeing baby pelicans and baby egrets at the island currently, plus we are seeing nesting pairs of Roseate spoonbills and the great news is the fact that we are seeing more and more of these unique pink birds every year the past 4-5 years. On top of all this great news and unique sights we are also spotting a few sea turtles cruising the back bays. It’s a little early for sea turtle nesting season but they are definitely starting to show back up in the area. The shelling around shell key and Egmont key has been out of this world as of late! The March weather has really blown up some great shells and the occasional shark’s tooth. Plus, when the weather is nice it’s a great time to spend the day having some fun in the sun on the islands! Water temps are perfect right in in the mid 70’s to cool you down from the hot sun but not too chilly to snorkel or swim and enjoy the water too! PLUS, the water clarity right now is INSANE around shell key and Egmont key! Join us for a ferry ride to paradise today to enjoy the crystal clear waters between the storms fronts, when a front blows by the waters get a little murky for a day or two then it clears up to gorgeous once again shortly after the waters calm down. Great time to visit us for a ferry ride to Egmont key or shell key since the temps are too hot and the temps aren’t too cold to explore the island! Plus, the bugs aren’t too bad yet in the warmer summer months. Since its still a little chilly at night, it’s also a great time of year to spot the plentiful gopher tortoise at Egmont key when they are out sunning themselves in the morning sun trying to warm up from the chilly overnight temps! We even saw some manta rays this past week around the Shell key and Egmont key islands along with dolphins, manatees, seabirds and the occasional sea turtle! Come join us for a day at the island, more info on both ferry ride options below.